In its Asian origins, Grace was a boy’s name. Hannibal Barca certainly had some grace. His second name, translated as Lightning Bolt, was really appropriate ~ as the Romans discovered to their great cost. No relation at all to Hannibal Lecter (let’s get that out of the way), Hannibal Barca was a politician, strategist and military commander who might well have changed the future of Europe, Asia and Africa. He could so easily have become the Julius Caesar of history. If Hannibal had prevailed, there would have been no Caesars, no Roman Empire and who knows what other consequences throughout the ages. Christianity, without its patronage from Rome, might never have spread across the world. And all that so nearly came to pass. The reason: Hannibal was an early foreign opponent of Rome. He trounced the Romans in three major battles and scared them so much they forever used the phrase “Hannibal is at the gates” as their equivalent to “the end of the world is nigh”. Hannibal was a Carthaginian. We don’t hear much today about the city of Carthage, . That’s because they were eventually annihilated by Rome. 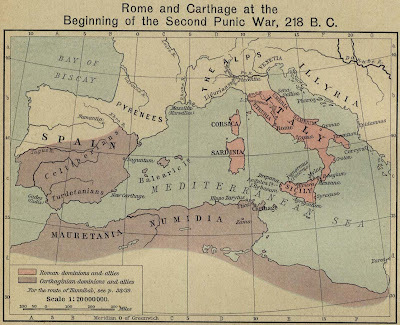 But while Rome was still a city state and was yet to show its genius, Carthage was ruling a huge empire. The fertile lands of what is now Lebanon and the southern part of Syria led to the rise of Phoenicia, a civilization whose intelligence invented what was to become the basis of the modern English alphabet. They were clever in another way: their need to trade their produce developed them into expert boat-builders. They probably invented the galley, the first vessel propeled by banks of rowers and good for speed – and warfare. Their influence spread across the Mediterranean. One of the Phoenician outposts was Carthage, a city located near the modern Tunis in North Africa. The immigrants seem to have inter-bred with the Africans, producing a population with a mix of Asian and African appearance. a heartbroken Elissa threw herself into the fire. There’s reference to that in my book, The Dust of Cannae. As it grew increasingly independent of Phoenicia, the city of Carthage’s maritime skills enabled it to establish its own empire, taking in Spain and Portugal and – crucially – Sicily. Sicily was the catalyst for the wars between the Carthaginians and the Romans. Carthage, by then about 500 years old, was a supreme power. Rome, which had won continual battles with the neighbouring communities, had taken control of most of what is modern Italy. Rome’s knack for architecture and engineering was already well-advanced. The Roman roads, dead straight and of closely-packed stone, helped to maintain its hold over Italy. The Romans also had a standing army, while Carthage’s citizens were mostly engaged in seafaring and trade and therefore depended upon mercenaries for their military. Here are some excerpts from my book, The Dust of Cannae, giving a snapshot of how the hostilities between Rome and Carthage led to the emergence of Hannibal. “It’s a war against Carthage. 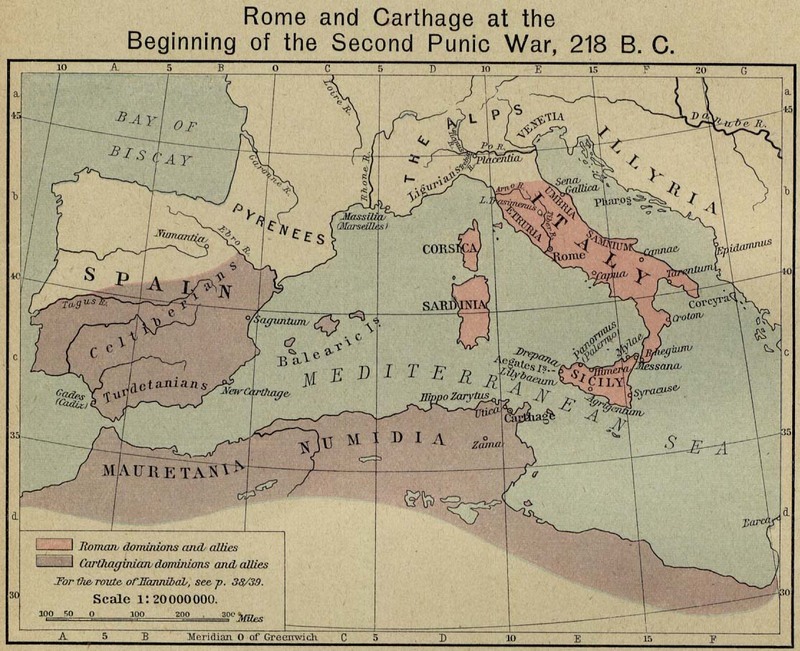 The name Punic is used because the Carthaginians originated in Phoenicia in Asia. They sailed across two seas and set up the city of Carthage on the African coast. That’s how advanced they are and I suppose they were bound to conflict with us one day. Rome and Carthage were like two wrestlers waiting for the signal to fight. WAS HANNIBAL BLACK OR WHITE? HANNIBAL’s ancestors were of what we would call Mediterranean appearance but by the time Hannibal was born, the city of Carthage was five hundred years old and there would have been inter-breeding with the local African populations. 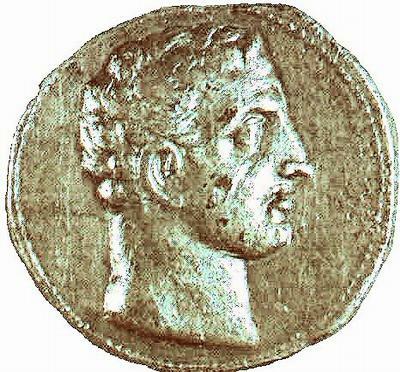 The coin (below) which may depict Hannibal appears to show a white man. So do the two known statues of him. that he was white, which would mean similar to the complexion of a modern-day native of Lebanon or Syria. Left: A Roman sculpture of HannibalExcerpt from The Dust of Cannae:From his looks, Hannibal might have been a philosopher or teacher rather than a man who gave away his life to a consuming psychopathic cause – the destruction of Rome.His face was quite narrow and topped with dark curly hair. The small chin emphasised the long hooked nose that could, ironically, have been that of a Roman. His cheeks were full enough to make grooves at the sides of his mouth. The ears were flat and the beard usually cut back to about one inch. “The first thing that surprised me was how young Hannibal was. When I joined his army in Spain he was only twenty-six, and I couldn’t imagine a man the same age as me having such responsibility for thousands and thousands of men, especially when many of them were a lot older and were very seasoned warriors. “We crossed two big ranges of hills and some wide rivers. We met many hostile tribes along the way and we either beat them easily or Hannibal tricked them. But as we went further, I began to think he must be a madman. He took men, horses and even elephants up the slopes to the top of the world where everything is white and frozen. More than half the army and many of the animals died of the cold or through accidents in the ice and snow. Hannibal and elephants crossing the Alps. A fresco by Jacopo Ripanda. 1510, in the Capitoline Museum, Rome. “When at last we came down from the mountains I thought we would have to go all the way back again; that we would not be able to fight the Romans because so few of us were left alive and many were sickly and weak. Nearly all the elephants had been lost and those that remained died soon afterwards. We men thought that Hannibal had made a terrible mistake. But whenever we saw Hannibal walking amongst us – and he did that all the time – he was positive and bold, even when he lost his eye after an illness. We would go on and conquer Italy, he told us. “The Romans sent two commanders of equal rank to Cannae and, according to the rumours, they argued. One wanted to do battle here; the other said this would be the wrong choice because the level open country suited cavalry and Hannibal had the superior mounted units. It would be better to draw him away to ground more beneficial to the infantry because that would give us the advantage. Our foot soldiers outnumbered Hannibal’s by two to one. “Not immediately. We fought against both the maelstrom and the enemy and we were driving the Carthaginians back, or at least we thought we were. But Hannibal hadn’t only planned for the weather; he had the better tactics as well and we fell into his trap.